Shirts With Random Triangles: Tennessee lands 2015 commitment from defensive tackle prospect Kahlil McKenzie. Tennessee lands 2015 commitment from defensive tackle prospect Kahlil McKenzie. Kahlil McKenzie. Via Bleacher Report. Tennessee's 2015 recruiting class added its 20th member on Thursday. Concord, Ca. high school rising senior defensive tackle Kahlil McKenzie committed to the Volunteers made his announcement on ESPNU Thursday night. Naturally, McKenzie discussed his commitment on Twitter. McKenzie is the son of Oakland Raiders' general manager Reggie McKenzie He was a linebacker for the Vols from 1981-1984, and played for the Los Angeles Rams and San Francisco 49ers in the NFL. The 247Sports.com composite intangibles for McKenzie are as follows. 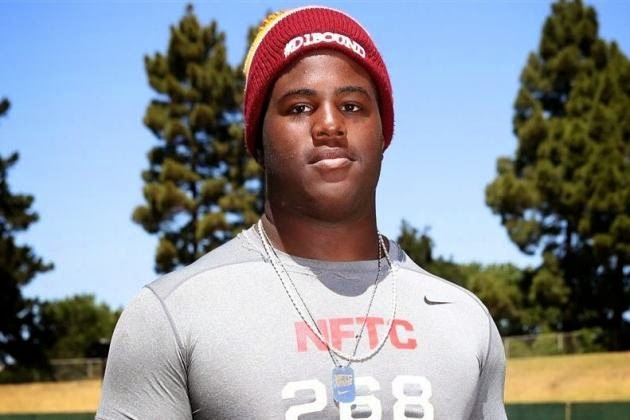 McKenzie is a five-star rated defensive tackle. He is ranked 7th among 2015 DT prospects, ranked 7th among 2015 prospects in California, and ranked 32nd overall among all 2015 prospects. McKenzie is ranked 95th in the ESPN 300. McKenzie will attend Clayton Valley Charter High School in Concord, Ca. in the fall. He stands 6'4", and weighs 330 pounds.